Men’s tennis senior Ugur Atalay and women’s lacrosse senior Sarah Phillips are the outstanding senior student-athletes of the year, nabbing the top prizes at today’s Senior Honors Luncheon. Atalay, who was named to the A-10 first team April 26, took home the J. Dallas Shirley Outstanding Senior Male Student-Athlete award, given to a graduating male senior who demonstrates achievement in athletics, academics and community service. 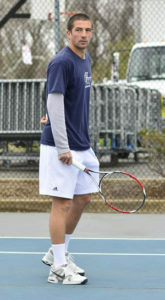 Atalay earned a 21-9 singles record and a 18-8 doubles record this season for the A-10 champion Colonials. Phillips was awarded the Lynn George Outstanding Senior Female Student-Athlete award after earning first team honors April 27. Phillips, who is the women’s lacrosse program’s all-time leader in points and assists, paced the A-10 and ranked in the top 10 in NCAA Division I in assists this season. Senior rowers Eric Anderson and Mackenzie Hovermale captured scholar-athlete of the year honors at the luncheon, and 24 student-athletes were named the most valuable players for their respective teams. Senior guard Tiana Myers took home MVP honors for the women’s basketball team, and, for the second straight year, senior guard Tony Taylor is the most valuable player for the men’s basketball team.